Fly from here into the bluest sea - Courtesy gichristof Fly from here into the bluest sea. In amongst all these islands lies the gem that is Lefkada. This little island, which is accessible from the mainland via a small bridge, is a paradise for the sailing crowd, but more recently a world recognized hot spot for kite surfing. Crossing onto the island you can see hundreds of kites flying high above Milos beach (as in home image). All this as you pull into the main town. The town Lefkada offers all the amenities any town should, from restaurants, hotels, and banks, to a market and assorted shops. 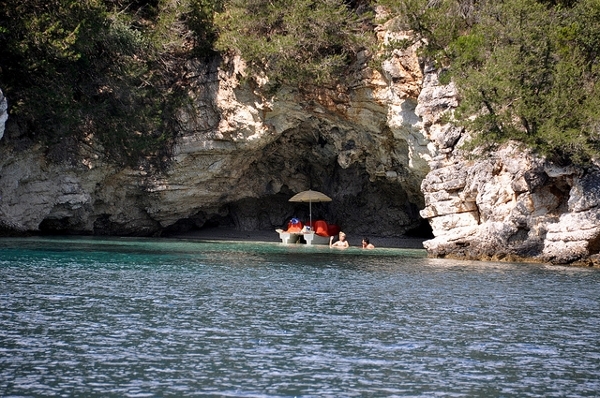 But no one comes to Lefkada for the accommodations. 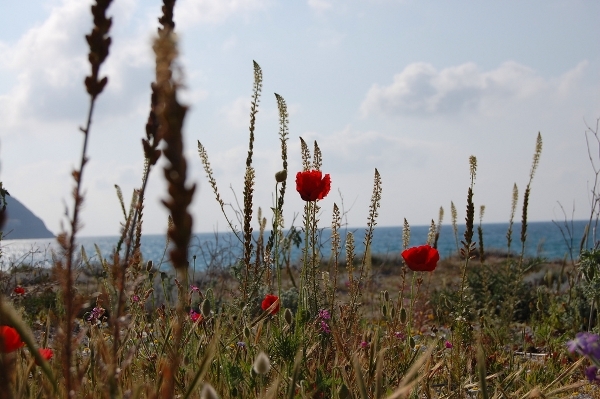 Heading out of town, visitors start making their way along the coast, their senses being overwhelmed by the colors of nature (as above) that enveloping them, from the green vegetation, to the sharp blue sea and the myriad of white and grays of the cliff faces. 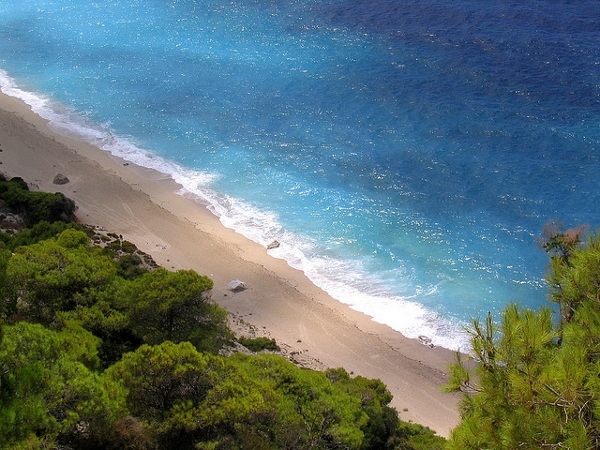 Lefkada is a place where cliffs dominate almost every view. 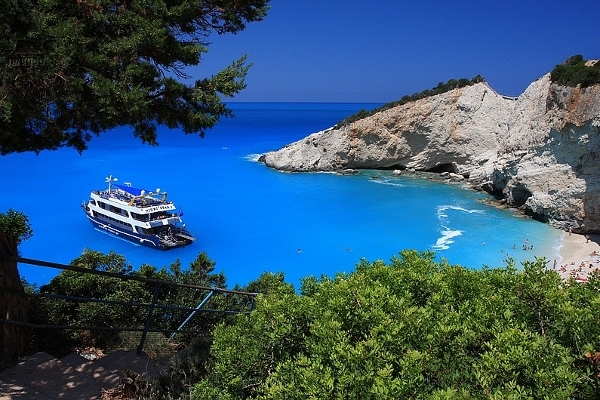 A multitude of bays and natural harbors, it is no surprise that Lefkada is a favorite among Europe’s sailing crowd. Head into Nidri, the second biggest town on the island, and at sunset and you’ll be treated to a spectacular view of the deep blue bay, pockmarked by little white sailing boats, truly a unique sight. No trip to Lefkada is complete without a day spent at sea of course, missing the wind and salt-water spray on your face here is sacrilege. You can easily organize a tour of the Island, maybe the best way to visit some of Lefkada’s most impressive beaches including; Porto Katsiki, a sliver of coast located at the base of a 100+ meter cliff. And let’s not forget the private island owned by Aristotle Onassis – yeah you heard of him. Skorpios (image above), which the legendary shipping magnate and once richest man in the world, is located a short distance off the coast of the main Island. Rumor has it that some of James Bond villains’ lifestyles were inspired by this modern Greek legend of a man. If Lefkada was good enough for the world’s richest man to buy a large part of it, then it must be a paradise on earth – correct? 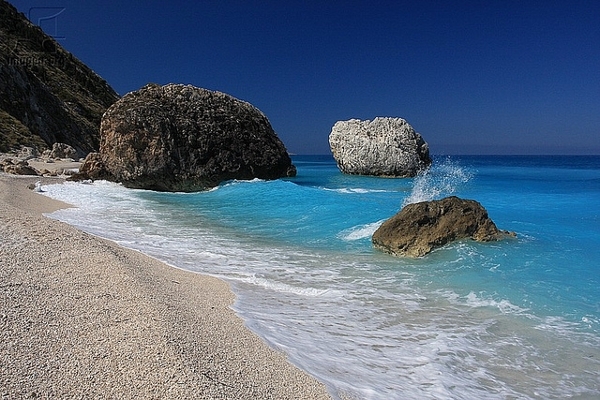 I suggest you rent a car, hop on a bus, or even take the plane from Athens and spend some time in Lefkada. Billionaire guarantee perfection! 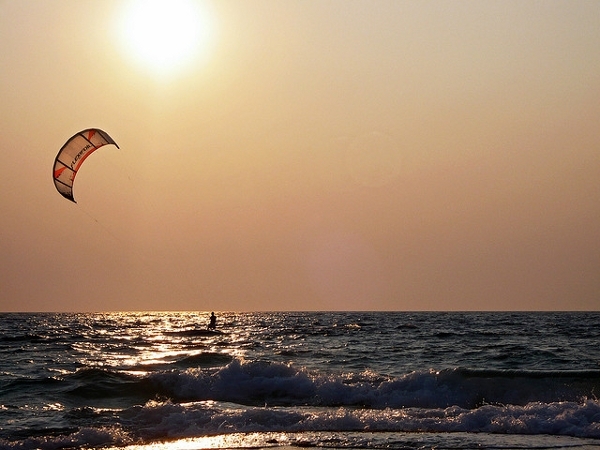 We leave you with some extreme kiteboarding footage from 2008 off Lefkada, enjoy.